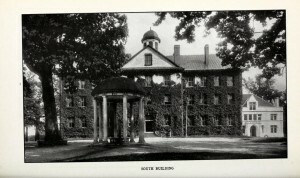 South Building and the Old Well, 1909. Courtesy of the North Carolina Collection, UNC-Chapel Hill. 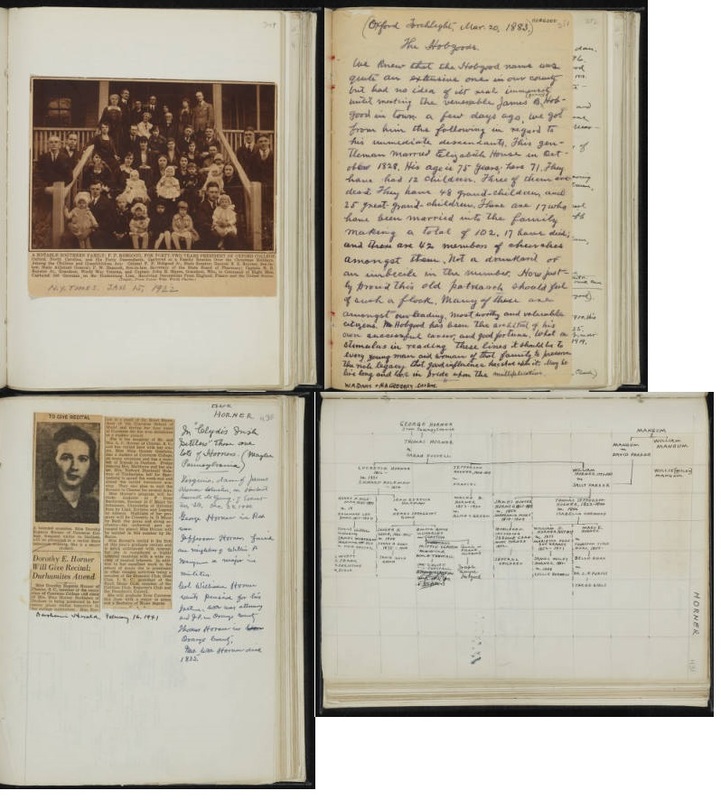 The University Records from 1901-1940 are now available on DigitalNC. The University Record was a UNC publication that reported on various aspects of the University. There are annual reports on each of the schools of UNC–their enrollment, course catalogs, and other information–as well as reports on current research, Commencement programs, and general promotional materials about UNC. One of the annual publications is the President’s Report, in which the current University president describes the events of the past year and plans for the year to come. These reports can shed light on important debates that were happening on campus in the first half of the 20th century. 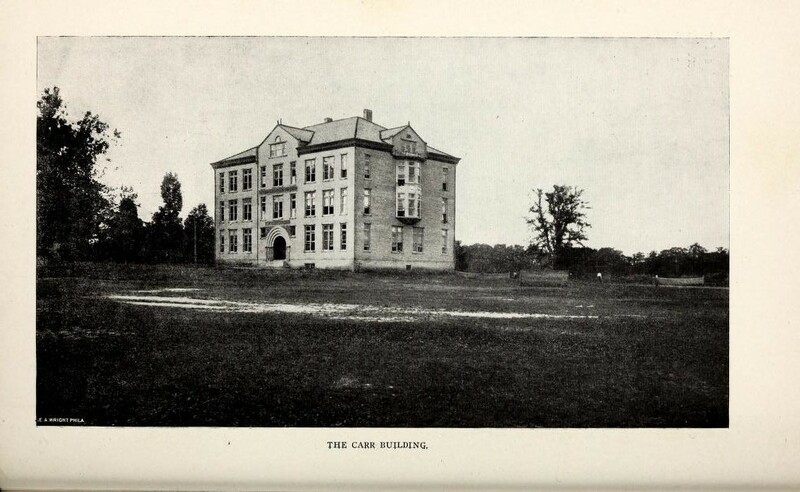 The Carr Bulding, 1902. Courtesy of the North Carolina Collection, UNC-Chapel Hill. For example, in 1918, the debate surrounding the admission of women to the university was of such importance that the Chairman of the Faculty, M.H. Stacy (President Graham had died earlier in the year), closed his President’s Report with an inspiring call for the university to adapt to the times and make full provisions for the female students. He includes a letter from Mrs. T. W. Lingle, the Adviser to Women, who calls upon the university to seriously attend to the matter. “To continue to admit them in a half-hearted way, and to furnish them with classroom instruction without the other features which make up the all-round college life, is a rather doubtful kindness to them,” she writes, and Chairman Stacy recommends the expedient construction of a women’s building. 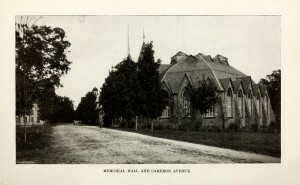 Memorial Hall and Cameron Avenue, 1903. Courtesy of the North Carolina Collection, UNC-Chapel Hill. So was this women’s building ever constructed? The following year’s Report does not include any mention of women at all. Chairman Stacy, who had so fervently supported this women’s building, died of influenza, and Mrs. T. W. Lingle, Adviser to Women, had resigned (Mrs. M. H. Stacy, presumably Chairman Stacy’s wife, was appointed the new Adviser to Women). Though the 1919 Report discusses at length the remarkable increase in enrolled students, the fate of female students is unknown. 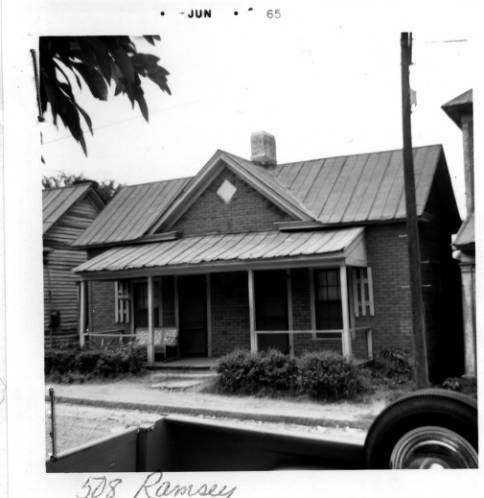 Our colleagues over at the State Library of North Carolina are highlighting a North Carolina county every week and in honor of this week’s county, Robeson, we are taking a closer look at the city directories from Robeson’s county seat, Lumberton. 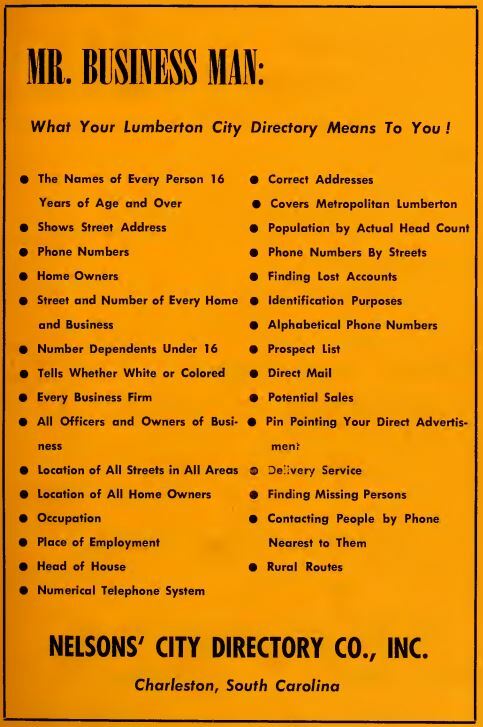 In DigitalNC, we have four city directories from Lumberton, that span the time period of 1916-1956. 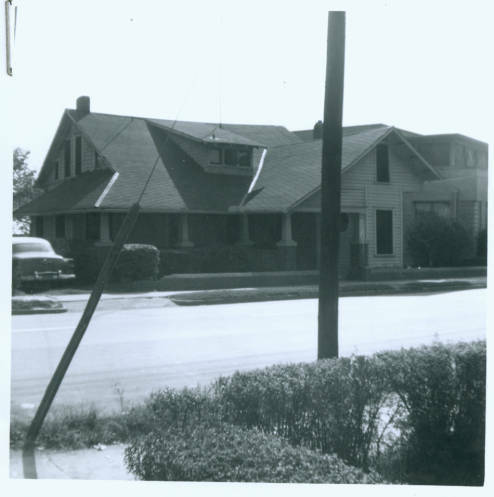 The directories highlight the changes and growth in Lumberton over this time as it moved from a town of approximately 3,000 residents to one of 18,119 people by 1956. 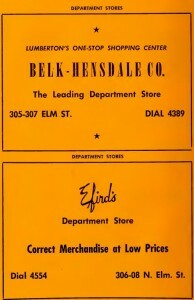 City directories, which were printed by private companies, provided many of the services that a telephone book did later in the 20th century, but they tended to include more elaborate information about the residents in the town, had extensive advertisements, and often added civic information. The Lumberton city directories were no exception. Example of directory information on residents. Directory is courtesy of the North Carolina Collection, UNC-Chapel Hill. 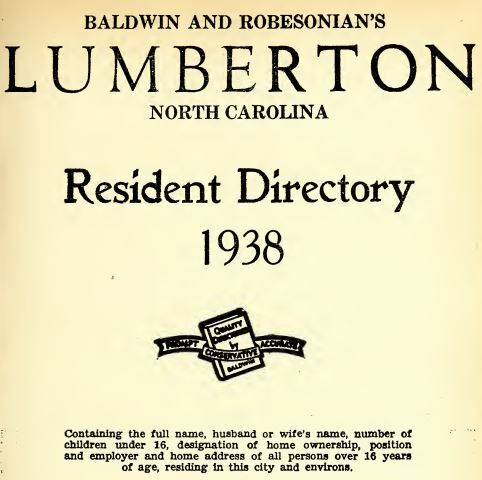 The directories for Lumberton in DigitalNC were published by three different publishers, all based out of South Carolina; Gardiner, Baldwin, and Nelson. These publishers took it upon themselves to do a census of all the residents and businesses in town. The information gathered on the residents not only included their address, but how many people lived in the house and their occupations. Information such as race and whether or not the house was owned by the resident was also included. Extensive civic information is also included in several of the directories, particularly those produced by Baldwin. Not only is a town history provided, with images of the hospital and schools in the town, but also a complete listing of who was in office at the time, both in the North Carolina government and every single member of Congress, and the Supreme Court. As the city directories were handed out free to those in the town, revenue for the directories came from advertisements, which are a rich source of information about the types of businesses in the town and the types of products they were selling. You can see over time how there was a shift from locally owned small shops to more franchise based operations. 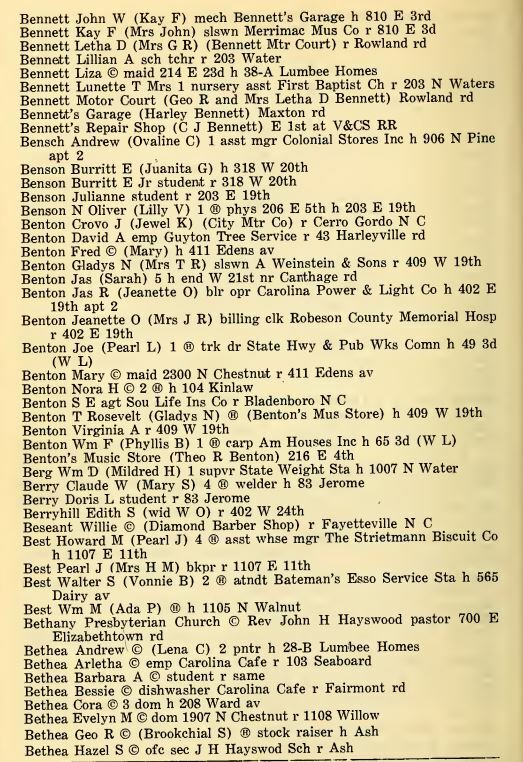 For example, in 1916 a local millinery shop is advertised and in the 1956 directory, several regional and national department stores are advertising. 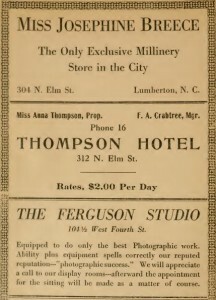 Ads in the 1916 City Directory. Courtesy of the North Carolina Collection, UNC-Chapel Hill. Ads from the 1956 City Directory. Courtesy of the North Carolina Collection, UNC-Chapel Hill. For more information on the history of city directories and their use as a research tool in the 21st century, the New York Public Library has an excellent blog post here. For more city directories from towns and cities across North Carolina, check out DigitalNC’s City Directories Collection. 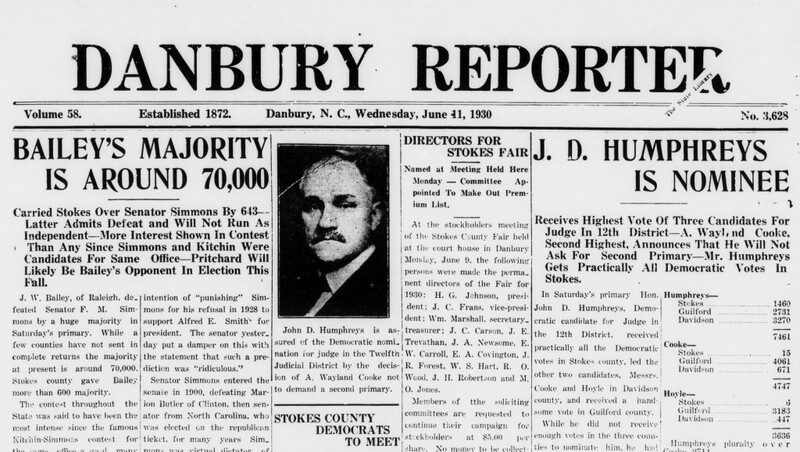 Issues of The Danbury Reporter from 1872-1945 are now available on DigitalNC. A weekly paper published in Danbury, NC (Stokes County), the Reporter is a mix of local, county and national news, with an emphasis on farming and politics. This title is part of our Newspaper Digitization project, and was selected by the Danbury Public Library, part of the Northwestern Regional Library. Here on our blog, we occasionally feature “matchups” that showcase relationships between different items in our collection. Today’s matchup? An advertisement from The Carolina Times and some photographs from the Durham Urban Renewal Records of the Durham County Library. 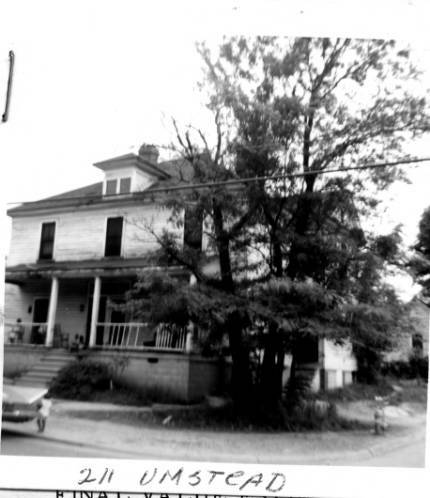 The Durham Urban Renewal Records collection on DigitalNC, from the Durham County Library, contains thousands of photographs and appraisal records documenting efforts in the 1960s and 1970s to combat what was seen as “urban blight” in several downtown neighborhoods. 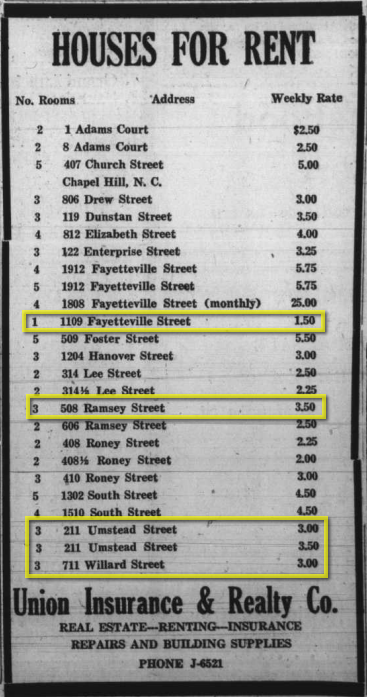 Recently, while browsing The Carolina Times, a Durham newspaper, one of our staff members noticed an advertisement for Houses for Rent on page 3 of the November 16, 1940 issue. It turns out several of these properties are pictured among the Records collection. 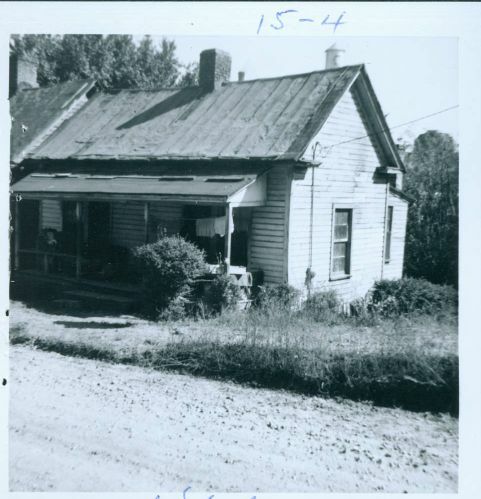 After the federal Housing Act of 1954, the North Carolina Division of Community Planning set about examining and appraising many urban communities in North Carolina. Although this sort of scrutiny was common through the 70s, there are few areas that acted on perceived “urban blight” as drastically as Durham did. The 1940 advertisement is interesting for what small bit it tells us about the community but also bittersweet as these houses were all demolished when local government chose to repurpose the land occupied by the African American community known as Hayti. You can read more about Hayti on LearnNC. In addition, the Endangered Durham website has some supplemental information on 1109 Fayetteville Street, as well as additional photos of the area in more recent times. Sherlock Holmes in Wilson, N.C. Fans of the BBC series Sherlock who are eagerly awaiting in the next installment would have found kindred spirits in Wilson, N.C., in 1895. In the winter of 1895, the Wilson Advance, the local weekly newspaper, announced that it would serialize a recent novel, “The Sign of the Four,” featuring a character who had been introduced only a few years before but was quickly gaining popularity worldwide: Sherlock Holmes. The first Sherlock Holmes story by Arthur Conan Doyle appeared in a London magazine in 1887. More stories and books followed and found eager readers in England and the United States. 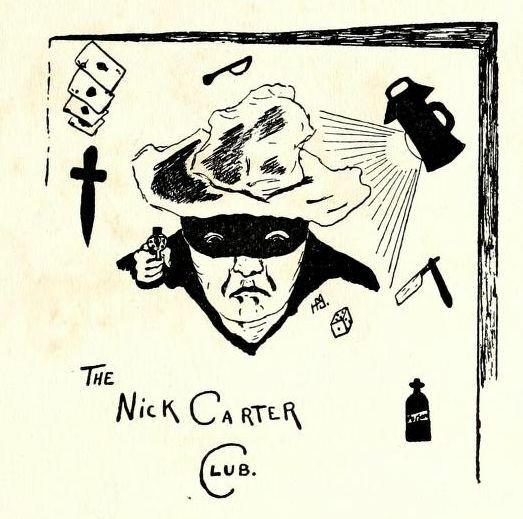 In 1894, Doyle went on a lecture tour of the United States (though apparently he did not visit North Carolina), which helped to increase interest in the stories of the fictional detective. On the front page of the February 28, 1895 issue, the Wilson Advance announced that they would be publishing Doyle’s novel, “The Sign of the Four,” the second full-length Holmes book, which had originally been published in the United States in 1890. 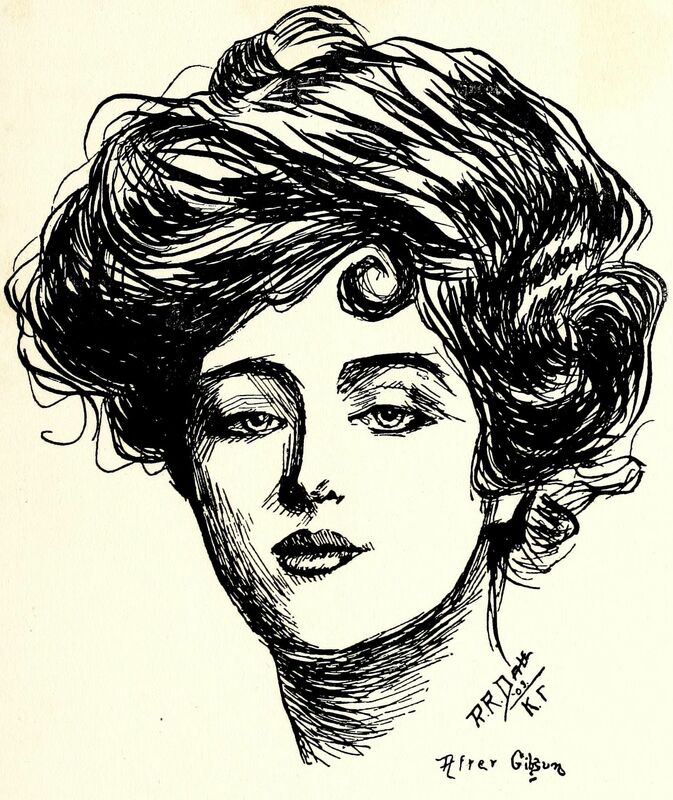 The Advance began running the story in the March 7, 1895 issue, often filling most of a page with the text and illustrations. Installments appeared throughout the spring, finally finishing in on June 13, 1895. There’s nothing in the paper itself to indicate how the story was received, though in an age before radio, TV, and movies, it’s easy to imagine kids and adults alike anxiously waiting for the paper to arrive and quickly turning to the back page to find out what happened next. Issues of The Carolina Times from 1965 to 1972 are now available in the North Carolina Newspapers collection on DigitalNC. These join issues from 1937 to 1964 that were already accessible on DigitalNC. The Carolina Times, a weekly paper based in Durham, was edited and published throughout this period by Louis Austin. 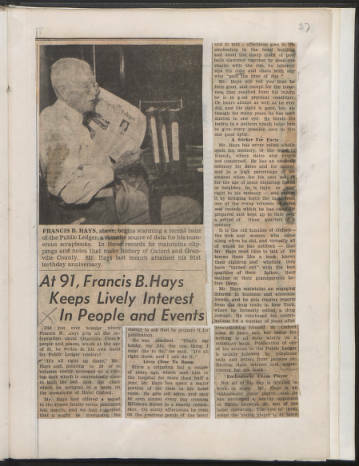 The paper covered and addressed the African American community in Durham and throughout the state. 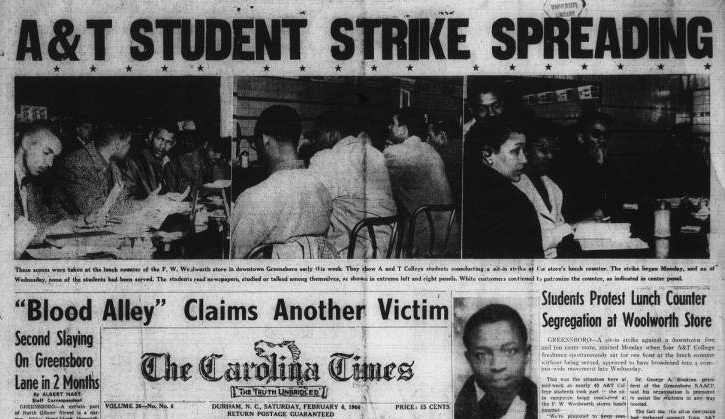 Austin was a tireless crusader for racial equality and The Carolina Times was a forceful advocate for civil rights. The paper was an important voice for African Americans who were too often either misrepresented or ignored in other media outlets. These issues were digitized and published at the suggestion of the Durham County Library. 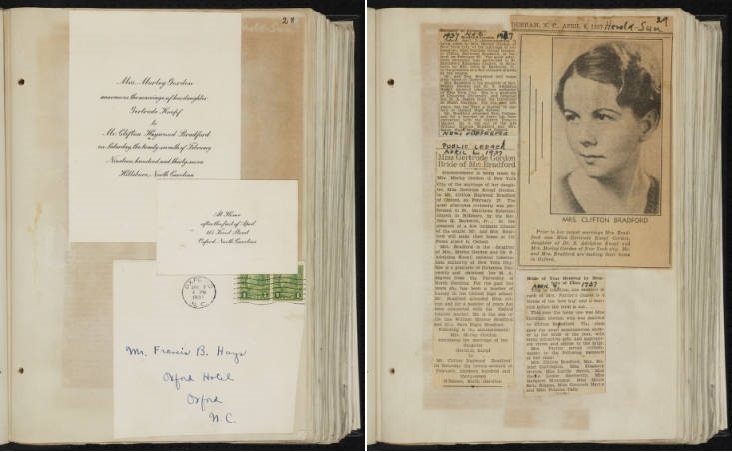 These scrapbooks belong to the larger Hays Collection, a many volume collection of Oxford and Granville County histories created by Francis B. Hays over the course of more than 75 years. These materials are part of an ongoing digitization project. More volumes to come! 94 years ago today, on January 17, 1920, the United States officially became a dry country, as the 18th Amendment banning the sale, production, importation, and transportation of alcoholic beverages went into effect. However, in North Carolina, it had little effect as the state had enacted prohibition via a referendum vote twelve years earlier on May 26, 1908, becoming the first in the south to ban alcohol. 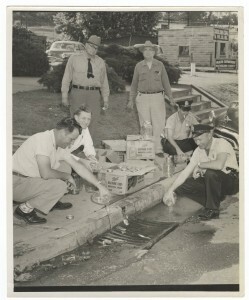 Prior to the full country being under Prohibition, North Carolinians would drive to Virginia or South Carolina to procure their alcohol and bootlegging quickly became good business in the state and those early bootleggers who fixed up their cars to be as fast as possible laid the ground for race car driving and eventually, NASCAR. Once full prohibition was in effect across the country, moonshiners also did quick business. In DigitalNC there are several photographs and newspaper articles about those who were caught by police attempting to make or transport liquor and many more expressing editorial opinions for and against prohibition. While nationwide prohibition ended with the 21st Amendment’s passage in 1933, North Carolina did not ratify the amendment and it was not until 1937 when the Alcohol Beverage Control (ABC) system was set up in North Carolina counties to sell alcohol that prohibition officially ended in North Carolina. 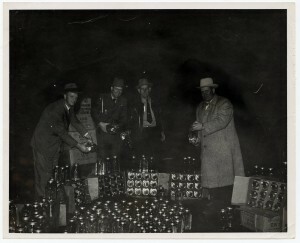 However, many counties still remained dry well after 1937 and post prohibition moon-shining and bootlegging was still a common occurrence in the mid 1900s. Today, Graham County remains as the only fully dry county in the state. 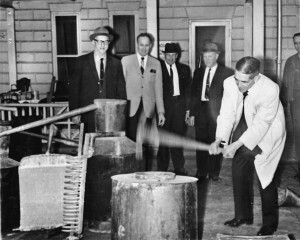 To learn more about prohibition in North Carolina, check out this post from the North Carolina Collection and this article in NCpedia. We’ve just posted Cloudbuster, the weekly newspaper of UNC’s Naval Pre-Flight program. 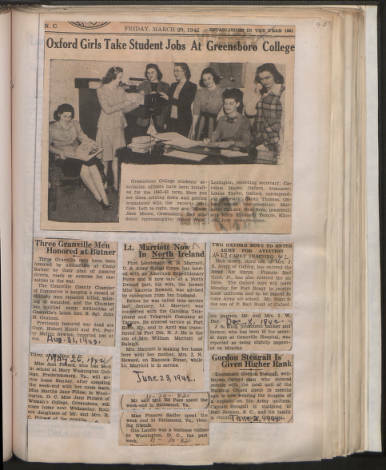 The paper was published from 1942-1945, and includes news about and by the cadets. The Navy baseball and football teams are well documented, as well as training activities, social events, and promotions. Check out a recent post on the NC Miscellany blog about the baseball player Ted Williams who was a cadet in the program and who played for the Cloudbusters team. The article features images from the paper. The Cloudbuster is shared online by the University of North Carolina at Chapel Hill. 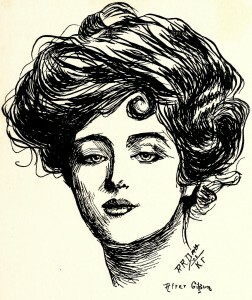 And, as might be expected in an all-boys school, many of their illustrations are of women – like this Gibson Girl penned by Robert Rodney Dale. There were a number of Bingham Schools in Asheville. This is the only yearbook we currently have for this school so I can’t be sure if the illustrative tradition continued. 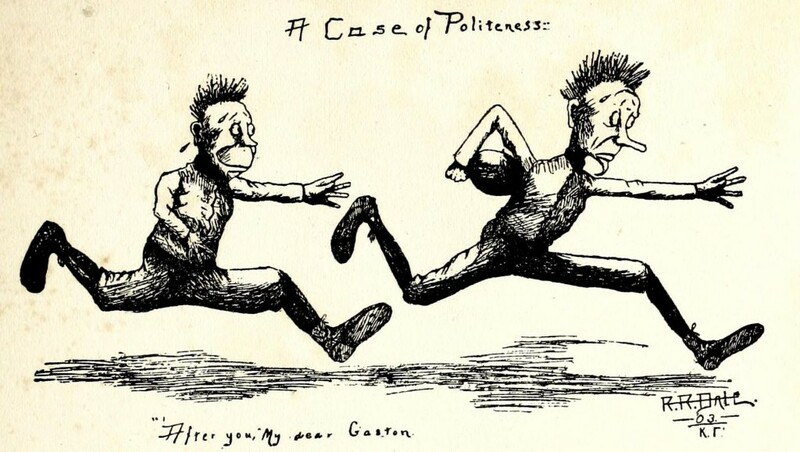 But the illustrations have given the school a very playful character in my mind, revealing more about the students than most of our other yearbooks from that time period. These volumes are shared online by the University of North Carolina at Chapel Hill.